A ganglion cyst is a benign tumor or “lump” that commonly occurs on both feet and hands. It arises in association with either a joint or a tendon both of which have tissue which produce fluid similar to what is found in a ganglion cyst. They are often associated with an injured tendon or arthritic joint. Sometimes they develop on their own. A patient will typically complain of a lump which has been present for some time but which seems to get larger toward the end of the day and sometimes seems to come and go. It may or may not be painful depending on the location and what other structures it may be exerting pressure upon. They are usually firm or almost squishy and slightly mobile. Average size tends to run approximately 2.0 cm. They are not typically found on the bottom of the foot. X-rays and ultrasound examination may be used to help identify and better visualize the extent of the cyst. 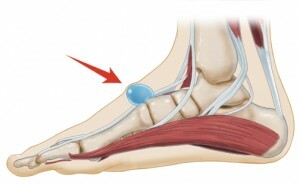 Treatment may briefly consist of conservative measures such as shoe gear modification or NSAID’s for associated pain. Typically, the area containing the cyst is anesthetized and then aspiration of the contents of the cyst is performed using a large diameter needle. A cortisone injection may be performed at this point to encourage regression. Unfortunately there is a high recurrence rate for these cysts when treated with aspiration and injection. For this reason surgery is often needed. Unfortunately, recurrence is also relatively high following surgical excision. Surgery for these lesions is usually outpatient in nature. It does require some degree of immobilization with healing of an incision for 10-14 days and depending on the size and location of the lesion, a return to normal activities in 2-4 weeks. If you think you have a ganglion, consider scheduling an appointment at Texas Foot and Ankle Specialists. We are conveniently located adjacent to the La Centerra outdoor shopping center across from Cinco Ranch High School in the Katy area of west Houston. We have convenient hours to accommodate a variety of schedules and offer same day appointments for those with pressing needs.